I've currently found myself in the middle of an equally intense love affair again, but this time it's directed at the lovely pineapple. I can't get enough of them. I've been eating at least one a day and not tiring of their sweet smell or taste in the least bit. In fact, every day when I wake I'm looking forward to eating another one. I'm so crazy about pineapples that when I find myself with a counter filled with only green organic pineapples, I'll actually ask Jim to pick up a ripe, nonorganic pineapple for me! I know, I can't believe I'm sometimes eating nonorganic fruit, either! But, there you have it...I'm not 100% organic, after all---and I'm a bit fickle when it comes to love affairs involving food. Did you know the Thai coconuts aren't organic, either? Not only are they not organic, they are many times treated with chemicals to keep them from turning moldy.There were rumors going around that they were dipped in formaldehyde, but the lovely Matt Amsden (of Rawvolution) had some tested to see if the rumors were true, and found that they weren't. Even if they were, the amount of positives my body received from those young coconuts was worth the negatives of ingesting chemicals. They took me to a higher level of health, as I feel the pineapples are currently doing. What have I noticed after consuming so many pineapples for the past few weeks? Well, it's pretty amazing! I've had rosacea since about the time I gave birth to KDcat, over thirteen years ago. Rosacea is a common skin condition in fair-skinned people (particularly if you are from a Celtic descent), where parts of the face become flushed or there are patches of red. For me, it has always been worse on my nose and my cheeks. Different foods used to trigger it, making it more noticeable. Intense changes in temperature would do the same, as would exercise. Well, the last time I visited with the holistic doctor, she mentioned my rosacea. I asked her what causes it, and whether there's anything I can do for it. She said it many times comes from low stomach acid (Hydrochloric Acid or HCL), which happens to be one of my remaining health issues. Low HCL is what causes me to not absorb enough B12 and iron. I have always felt that eventually raw foods would help my stomach acid reach a healthy level, though, so I haven't taken any kind of supplements to aid my digestion. Well, guess what? My rosacea is clearing up! That, to me, means that my stomach acid must be getting to a healthier level! When I was younger my skin was flawless, almost like porcelain. When I got older and the redness started showing up, I used makeup to cover up the patches of red. I rarely wear makeup anymore, so the redness is almost always visible and I have never gotten used to it. Lately, however, I've noticed that it's fading! Some days there is next to no redness on my cheeks, and my nose is more a patchy red than all-over red! I had a feeling that the pineapples must be causing the change, so I did a little research. Pineapples are loaded with bromelain, a source of beneficial digestive enzymes. They break down the foods in the stomach, aiding any natural stomach acid digestion that is taking place. People have been eating pineapples to aid in digestion for a long time, and here I find myself doing the same!? Let's hear it for new love affairs and following our instincts when we are drawn to something on some deep level. I just love that my body can give me signals for what it needs, and that I am connected enough to hear the messages! Who knows how long this love affair will last, but it sure is doing some amazing things for me right now! So, what's new with all of you? Have we lost readers because we haven't been able to keep this blog regularly updated? What are your thoughts about pineapples? I always heard that they don't ripen once they've been picked, but I've since found that they actually do ripen if you are patient enough (thanks to a sweet employee at the food co-op who encouraged me to experiment with a green one). I've missed all of you and I hope you'll continue to be patient while we are away for days and weeks at a time. Thanks for the info. I know a couple of people with rosacea that might like to know about this. Wow! This was such an inspiring post, Wendi. I will be sure to forward this to anyone who asks me about rosacea. Does the pineapple ever hurt your mouth? Even when I wait forever to try and let it ripen, it still tends to hurt my mouth most of the time. How you feel about pineapple right now is how I feel about watermelon. I can't get enough of it! I ate a 40 lb one today... haha! Not all in one sitting. (((hugs))) to you and it's nice to read your blog again! I'm like you are with cacao when it comes to pineapple...I have to just have a little at a time, or in a blended smoothie. Otherwise it burns. 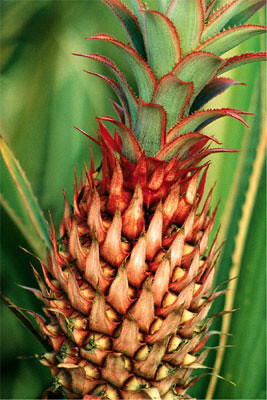 I've heard that pineapple grown in the tropics, wild or in small farms does not have that burn quality. Hmm... yet I love love love it too! Great post! So interesting about pineapples! It seems that stomach HCl thing is really important to our health. I'm glad to hear yours is coming back up. I'm glad you'll be posting more blog entries, too. I love reading your blog. Thanks for sharing Wendi, I know it is difficult when having so many things going on in your life. I know two things about pineapples I can pass on...when trying to decide if the pineaple is ripe enough to eat, besides the smell, pull one of the leaves from the middle if it comes out easily it is ripe. Also I heard if you turn the pineapple upside down when ripening, it has a sweeter effect. Sometimes you will notice the pineapple is sweeter on the bottom, that is because the juices stay at the bottom unless it is turned upside down. Papaya and mango are also good for those digestive enzymes. In Viktoria B's book Green for Life, she is huge on drinking lots of green smoothies for raising HCL. So, my 2 cents worth! Glad to see you here! Thanks for the great entry... very inspiring that you were able to lower your cholesterol and conquer your problems with rosacea. Life is about transformation, and it's nice to hear that you and your family are in the process of life transformation! It's understandable if you are very busy at this time, so not to worry. I need to re-read some of your past posts anyways. Pixywinks, yes be sure to tell anyone with rosacea that they should try to increase their stomach acid to see if it helps the redness fade. It has been working great for me--and I sometimes apply the pineapple directly to my skin and it works well that way, too! Sarah, I don't usually eat it plain. I like it in smoothies--blended up with banana. Drinking it that way never gives me a problem. Sam, I read that people who already have high stomach acid, naturally, will have a difficult time eating things like pineapple. So, maybe you are already healthy enough you don't need the healing qualities in the pineapple? Thanks, Melissa! I love you! Julie, that's what I've found, too! I've been turning the pineapples making sure they are uniformly ripe and sweet! YUM! Faye, I don't care for papaya. However, I do love greens. I'm going to have to pick up Green For Life and finally read it. I never heard that about the greens and stomach acid. Thanks for mentioning it! Lots of love to all of you! It means so much to me that you read and comment on my blog! I like pineapples a lot. They are very tasty & now I came to know that they are very good to keep the acidic level in stomach at right level so, I will make sure that my family eats it too.